Directed by Dante Lam Chiu Yin, Hong Kong Blockbuster action movie ?The Viral Factor? stars Taiwan pop singer Jay Chou and Hong Kong mega star Nicholas Tse. As the biggest movie for Chinese New Year (especially the beginning of the Dragon Year), the movie opened on January 17, 2012 to excited fans throughout Asia. Filmed in Jordan, China and Malaysia, Emperor Motion Pictures invested over USD 25 Million on this much anticipated action film. This is the first heavy hitting movie for Emperor Motion Pictures in 2012, and it?s quite clear on the big screen that Nicholas Tse and Jay Chou took this movie very seriously. Both artists have gone the distance and performed many dangerous stunts personally. RedWolf Airsoft is honored to once again work with Emperor Motion Pictures in sponsoring the Viral Factor (following our previous sponsorships of Triple Tap and The Great Magician). On January 14 2012, The Viral Factor premiered on the 100th floor of the International Co mmerce Center in Hong Kong at the Sky 100 Restaurant. On this special evening, many stars attended to show their support for the movie, including Nicholas Tse, Jay Chou, lead female star Lin Pang, Malaysian star Crystal Lee, Andy On, Elaine Jin, Liu Kai Chi, Carl Ng Ka Lung, Deep Ng, and many more. 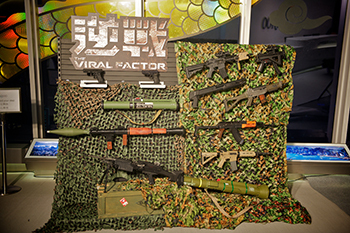 For the movie premier launch, RedWolf created a ?Viral Factor Armory? displaying various firearms that were seen in the movie. We also included some guns that did not appear in the movie but were along the same themes of the movie to make things even more interesting. 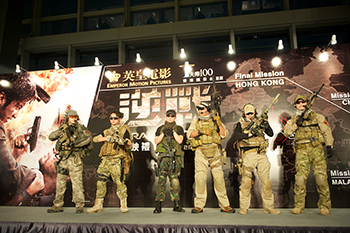 Guns on display include G&P?s M4, and a P228 as used by Jay Chou. 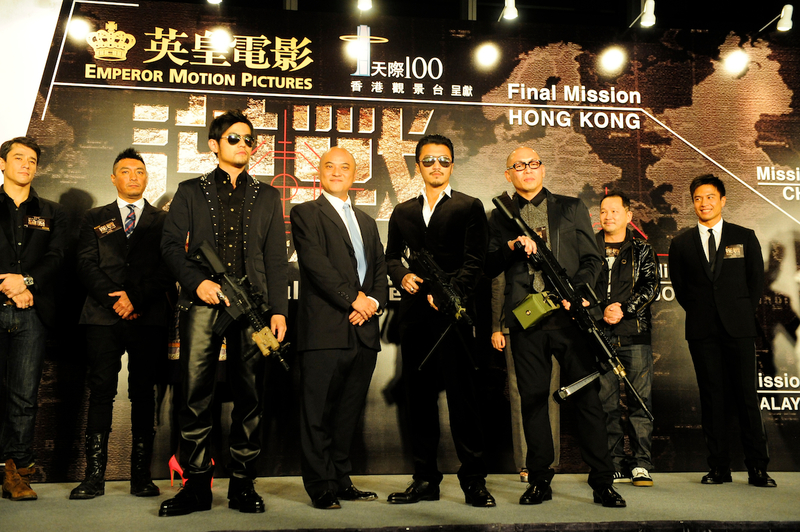 The M3 shotgun along with a G17 as used by Nicholas Tse were also on show. Andy On?s SG552 and MP5K (used by Michelle Bai Bing) also attracted a lot of attention. G&P?s M249 and a CAW RPG also got a lot of attention from the stars for their high profile appearances in the movie. 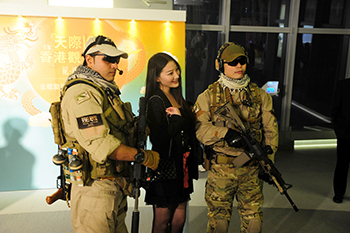 We also displayed a GHK AKMS, SOCOM GEAR M4 and Deep Fire AT4 for guests to admire. On completion of the award ceremony, Emperor Motion Picture?s Chairman, Dr. Albert Yeung, went on stage to perform a ribbon cutting ceremony in the form of pressing the ?power-on button? to officially launch The Viral Factor. 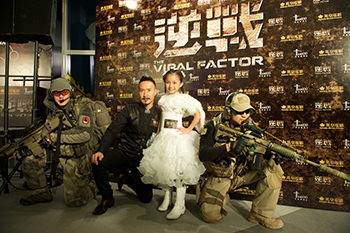 Under enthusiastic applause, The Viral Factor launched at the beginning of the Year of the Dragon to go on to become the top grossing movie for the holiday season in Hong Kong. 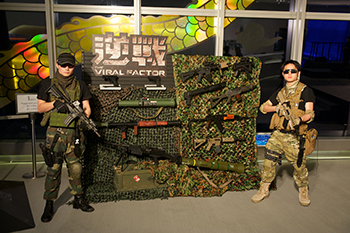 Throughout the event, many VIP guests and stars showed great interest in the Viral Factor Armory and handled many of the guns on display. For example, Andy On and Nicholas? father Patrick Tse inspected the guns while being interviewed by the media. Thank goodness there were no accidental shots fired!